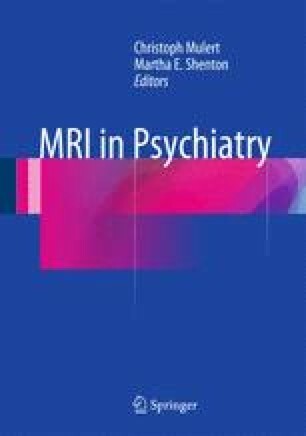 Diffusion tensor imaging (DTI) is an advanced magnetic resonance imaging (MRI) technique that provides detailed information about tissue microstructure such as fiber orientation, axonal density, and degree of myelination. DTI is based on the measurement of the diffusion of water molecules. It was developed in the early 1990s and since then has been applied in a wide variety of scientific and clinical settings, especially, but not limited to, the investigation of brain pathology in schizophrenia (Shenton et al., Schizophr Res 49(1–2):1–52, 2001; Qiu et al., Neuroimage 47(4):1163–1171, 2009; Qiu et al., Neuroimage 52(4):1181–1189, 2010), Alzheimer’s disease (Damoiseaux et al., Hum Brain Mapp 30(4):1051–1059, 2009; Mielke et al. Neuroimage 46(1):47–55, 2009; Avants et al., Neuroimage 50(3):1004–1016, 2010; Gold et al., Neuroimage 52(4):1487–1494, 2010; Jahng et al., Neuroradiology 53(10):749–762, 2011)), and autism (Pugliese et al., Neuroimage 47(2):427–434, 2009; Cheng et al., Neuroimage 50(3):873–882, 2010; Fletcher et al., Neuroimage 51(3):1117–1125, 2010). This chapter describes the basics of the technique, outlines resources needed for acquisition, and focuses on post-processing techniques and statistical analyses with and without a priori hypotheses.